The event is one of the ways the company seeks to gain traditional knowledge as part of the mine’s environmental monitoring programme. A dozen lake trout were caught from Kirk Lake by elders from Behchoko and Lutsel K’e, who were accompanied by a member of the mine’s environment team. Kirk Lake is about 20km downstream from the mine site. When the tasting took place, additional elders travelled to the mine. The event included a mine site tour and an opportunity to pick cranberries, blueberries and crowberries from land around the mine. 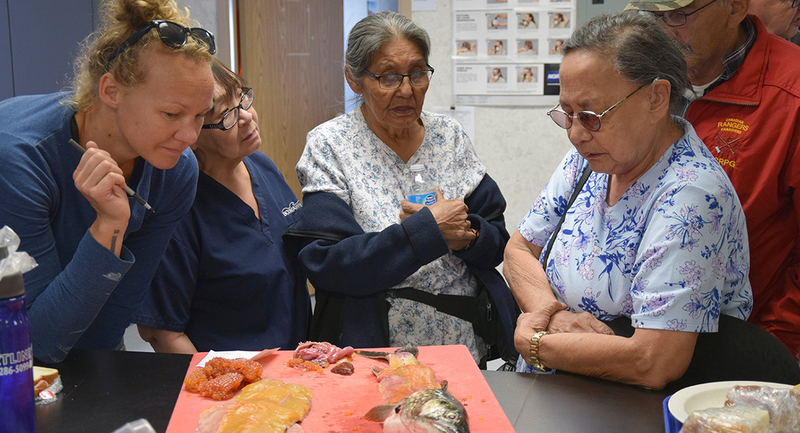 Elders examined and filleted each fish, commenting on the size, colour and exterior shape as well as the colour, texture of the tissue, parasites and other observations of the fishes’ internal organs. The fish were then boiled without salt, or any other spices, so the elders could discuss the taste of the fish. Lorette Edjericon from the Northwest Territories Métis Nation said: “I love the taste of it. It tastes just like home.” Wayne Langenhan, with the North Slave Métis Alliance, made use of the remains of the fish, taking the heads home to feed his dog team. Once the fish were boiled, elders had the fish cooked or fried for them how they liked and they enjoyed bannock made on a barbecue outside the mine’s Cultural Centre to close the day.